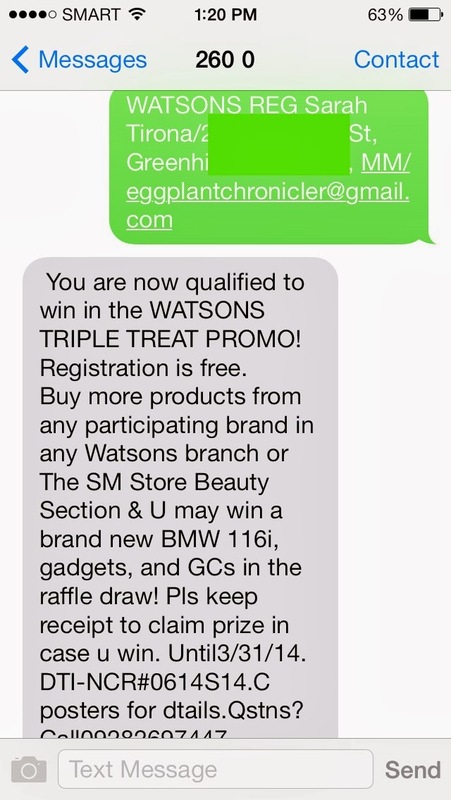 watsons triple treats: win a bmw/ipad minis, 5s/gc's etc. A chance to drive off into the sunset in a BMW? Why not? Watsons is giving away 50 iPad Mini's, iPhone 5s, and P1000 gift certificates every two weeks! Make sure to check for the "TRIPLE TREATS" sticker to be sure. After making your purchase, send in your entries again via SMS, simply text in your invoice number + number of entries earned to 2600. WATSONS (Invoice #/ no. of entries) to 2600. Make sure to keep those receipts as you will be needing them to claim your prize in case you win. ps. if you don't have an SM Advantage card yet, now's the perfect time to get one. WATSONS Triple Treats also means tripling your points for more rewards that you can use to purchase anything from SM!